Finishing your basement is a great way to add living space to your home! Gone are the days where damp, dark and gloomy basements are used solely for the purpose of storage. Today it is possible to transform your basement into a functional space that is just as warm, comfortable and welcoming as the rest of your home. A place where your family will enjoy spending quality time together. The options for finishing your basement are endless! Alert Restoration would be happy to discuss your basement renovation ideas with you. When you are thinking of basement renovation ideas, consider your family’s needs now as well as how they may change over time. Perhaps you have small children and you would like to create a play area for them. Or you may want your basement renovation to include a games room for your teenagers. With telecommuting becoming increasingly popular many people are building a home office. Creating a home gym or workout area is another popular basement renovation. If your family is growing and you are not ready to move, you may want your basement renovation to include an additional bedroom or bathroom. Building a separate suite is a basement renovation that appeals to homeowners who want to earn additional income. Home theaters and laundry rooms have always been popular basement renovations because they take advantage of the fact than many basements have less natural light and lower ceilings than the rest of the house. Use your imagination and you will find that the possibilities for finishing your basement are endless! Mold is a health hazard. Basement mold is a common problem because basements tend to have several sources of moisture and many food sources for mold. Because of this Alert Restoration’s certified mold professionals always inspect to determine if there are any moisture or mold issues. Any problems should be corrected before renovations begin. There are a variety of different waterproofing that will help to prevent moisture and mold issues. Because basements tend to have little natural light they are often dark and uninviting. However, careful planning of artificial lighting will ensure your finished basement is bright and welcoming. Depending on the height of the ground around your home’s foundation it may be possible to utilize window wells so that larger windows can be installed. If this is possible it is a great way to get more natural light into your basement. Low ceilings are another feature of some basements that can create a dark and gloomy feeling. If your basement has a low ceiling there are several renovating options that will create vertical space and brighten it up. Although it is common to install sub-flooring when renovating a basement, a floating hardwood floor is a good alternative that will provide an extra inch or two of vertical space. Vertical space can also be added by finishing the ceiling with drywall instead of installing a drop ceiling. Installing pot lights instead of hanging light fixtures is another ways to add space. There are several other renovating choices that will brighten up your basement and create a feeling of spaciousness. Opening up the basement staircase and designing an open concept floor plan will help create a spacious feeling. And of course, painting the ceiling white and choosing light coloured paint for the walls will brighten up your newly finished basement. Have fun brainstorming basement renovation ideas! Use your imagination and the possibilities will be endless. When you are ready, contact Alert Restoration. 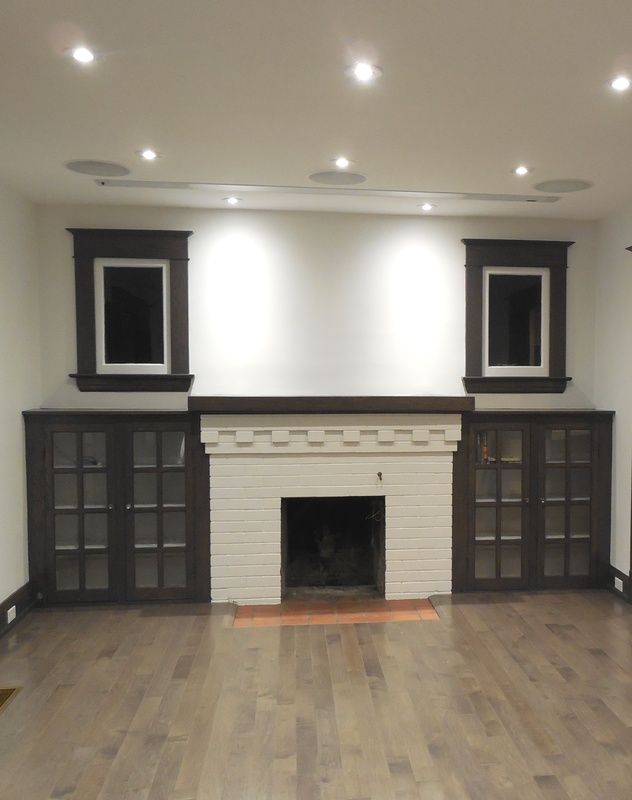 We provide basement renovation services to customers in Oakville, Mississauga and the surrounding areas. We welcome the opportunity to help you turn your basement renovation dreams into reality! I like to see that people are expanding their idea of what a basement should look like. Nice job Rob.